Although we perform a large number of cosmetic and restorative procedures, our practice emphasizes the importance of preventative measures. By helping you maintain proper dental hygiene and by treating problems in their earliest stages, we can reduce the number of cosmetic and restorative procedures you will require in the future. Most of the conditions that negatively affect your smile can be avoided with regular care. Dr. McConnell and his team are committed to answering your questions about proper hygiene and providing you with the most advanced preventive dentistry. This appointment is performed by a registered dental hygienist. In our practice, you will see the same hygienist at each cleaning visit so that you can develop a relationship. The hygienist will remove plaque (soft deposit), tartar or calculus (hard deposit), and stain from your teeth. The evaluation of the gum tissue, probing pockets and recording depths for future reference will be accomplished. After the cleaning, the hygienist will polish your teeth to a beautiful shine. You will have all of your questions answered that you may have about the homecare procedures and products. If you have trouble choosing the right toothbrush or flossing effectively, your hygienist can help. Should you develop gum disease, which is extremely common; our hygienist will provide counsel and treatment to control the condition. When the decay is removed from the tooth, it is replaced with “filling” material. Fillings are important to maintain your dental health. Unfilled cavities never go away and get bigger with time. You have options for your fillings, amalgam (silver) fillings have long been used and still are today. With advances in dentistry, you may also choose to use tooth-colored fillings, instead of silver fillings, to flawlessly match your existing teeth, giving you a brilliant, whiter smile! As a comprehensive dental practitioner, Dr. McConnell offers routine oral cancer screenings to you as a patient. As your dentist, Dr. McConnell is the only medical professional in a position to evaluate routinely and detect abnormalities. Early detection is important. There will be 41,000 Americans diagnosed with oral cancer this year and 12,500 deaths. The death rate from oral cancer is especially high due to late discovery of the disease. Prognosis is more positive with early detection. A patient who does not seek regular continuous care from a dental professional is putting their health at risk by delaying a diagnosis in the early stage of oral cancer. We are dedicated to providing this potentially life-saving procedure for you. Nightguard is a simple solution that protects your teeth and jaw from the harmful results of nighttime teeth grinding. Dr. McConnell provides a custom molded plastic mouth guard to comfortably fit over your upper teeth creating a barrier between your upper and lower teeth. The cushion between the teeth absorbs the force of grinding. A Nightguard reduces clenching, grinding and TMJ problems by helping relax the muscles in the jaw. Finally, rest comfortably again! Years of wear and tear, injury, or poor care can hurt the look and function of your teeth. Dr. McConnell and his team change lives every day through restorative dentistry. Rejuvenate your smile today! Are you missing teeth? Have you postponed getting a bridge or denture? Do you wear ill-fitting, loose dentures right now? Dr. McConnell wants to improve your quality of life with dental implants. A proper fitting denture is very important. A good fit ensures that your dentures will allow you to retain much of your function, which is important for maintaining natural muscle tone in your face and jaw. Dentures will keep you looking and feeling healthy, and will help you retain a natural lifestyle. A lifelike smile and the best possible fit - those are two of the primary goals that Dr. McConnell will achieve if you need dentures to restore your smile. You can erase years of wear and tear with porcelain crowns. Dr. McConnell uses a tooth-like crown made of porcelain or gold to restore your tooth after the decay has been removed. Crowns are also used to restore chipped teeth, broken teeth, gaps in teeth and other damage. Also called “caps,” porcelain crowns mimic natural looking teeth in shape and color. If you’ve lost a tooth, a large gap in your smile can create significant problems for your dental health if left uncorrected. Gradually, your bite pressure may shift to other parts of your mouth to compensate for an inability to chew efficiently in the area of the missing tooth. Neighboring teeth may begin to move into the gap resulting in discomfort, pain and more problems in the future. After some preparation of the two neighboring teeth, crowns are created for them. A prosthetic tooth, or pontic, is fused between the crowns. Fixed bridges literally "bridge the gap" in your smile. Dr. McConnell creates a functional, life-like bridge to correct your smile, restore your bite and alleviate your discomfort. Sometimes removing tooth decay effectively requires the removal of a portion of your tooth. The removed portion is replaced with a porcelain inlay or onlay. You doctor customizes an inlay or onlay to fill the space left behind when the part of your tooth is removed. Traditionally, inlays and onlays were made out of metal, much like traditional filings. Now, porcelain-milled inlays and onlays are virtually indistinguishable from natural teeth and provide relief from chewing pain, cavity pain and tooth degeneration. Most people who are unhappy with the appearance of their teeth do not realize the numerous ways cosmetic care can heal a smile. Cosmetic dentistry can correct crooked teeth, spaces between your teeth, chipped teeth, broken or missing teeth, stained or discolored teeth and having a "gummy" smile. 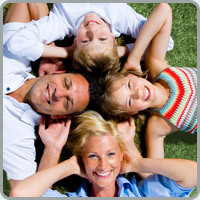 Dr. McConnell creates a customized treatment plan for you, based on your age, goals and your comfort level financially. Imagine a whiter, more brilliant smile! Placement of porcelain veneers is a conservative cosmetic treatment that makes a dramatic difference in the appearance of your teeth. 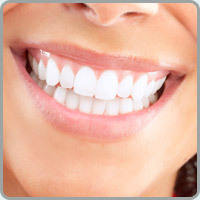 If you have crooked teeth, chipped teeth, gaps in teeth or dull or stained teeth, veneers may be the perfect solution. Dr. McConnell will skillfully create a straight, brilliant smile that enhances your appearance and your self-esteem. You can have the confidence that comes from a bright, white smile. If you are happy with the alignment and spacing of your teeth, a teeth whitening procedure may be all that separates you from a dazzling smile. Teeth whitening is safe, effective and long lasting. Your home whitening kit involves a special tray that is customized to fit over your teeth, to evenly disperse prescription whitening gel, which is inserted into the tray before you wear it. You can expect the entire home whitening process to take between two and four weeks, leaving you with a whiter, brighter smile. With home whitening, you can reuse your trays to touch up your smile whenever it needs a little boost. If you are thinking of other cosmetic improvements, such as crowns, porcelain veneers or replacing old discolored fillings, consider whitening your teeth first. Any future restorations will be matched to your whitened teeth, giving you fantastic results. You can erase years of wear and tear with porcelain crowns. Dr. McConnell uses a tooth-like crown made of porcelain to restore your tooth after the decay has been removed. Crowns are also used to restore chipped teeth, broken teeth, gaps in teeth and other damage. Also called “caps,” porcelain crowns mimic natural looking teeth in shape and color. When teeth are missing, your smile undergoes significant changes. Missing teeth can cause you to chew differently, may cause mouth pain, and as your remaining teeth work to compensate for the loss, gaps and spaces form that only make the situation worse. A porcelain bridge, custom designed by Dr. McConnell, keeps your smile aligned and your bite functional. Bridges are anchored to existing teeth or crowns on either side of the missing tooth. They are semi-permanent, meaning they can only be affixed or removed by a dentist and are a long-term restorative solution to your damaged smile. Your enjoyable dental experience depends on your comfort and safety. Dr. McConnell and his team utilize the latest technological advances in dental equipment and techniques to ensure your satisfaction with both your visit and continued excellent health. We offer digital radiographs (X-Rays). Digital radiographs us less radiation and are safer for you than traditional film x-rays. You will find that Dr. McConnell researches the latest trends in technology to find the solutions that promote your overall health, safety and comfort. Radiographs are a necessary diagnostic tool in the field of dentistry. More than half of each tooth is hidden and surrounded by bone. The only way to truly evaluate the health of your teeth and bone surrounding your teeth is through the necessary, diagnostic radiographs. Spectra® - a small portable unit - finds small cavities when they are first forming and can be missed by other detection methods. The benefit to you is cavities can be stopped at their earliest stages. Like every area of medicine, early detection and treatment is always the best option for the patient. An intraoral camera lets you see inside your mouth during both treatment planning and dental procedures. Our intraoral camera displays your teeth on a monitor or tablet, allowing Dr. McConnell to walk you through your proposed treatment. The use of this camera allows us to work with you as a team to meet your dental goals. Digital photography gives Dr. McConnell instant images to use for cosmetic imaging or to keep on file to track your progress. Digital images can be saved electronically and are more efficient than traditional photographs, which must be taken off-site for development.